Elvis Presley is known around of the world as the “King of Rock and Roll.” The life of this iconic music performer ended way too early. Now you can read about the incredible life of Elvis in a new book titled “Blue Suede Shoes: The Culture of Elvis“. The book includes stunning photographs from talented photographer Thom Gilbert. It’s a terrific, in-depth view of Elvis that draws the reader in. You get to see behind-the-scene looks at the life of Elvis Presley. He still is an iconic giant. This book helps to endure his legacy for many years to come. What I enjoy is the book shows numerous photos of his personal life. Elvis was a very private person. In part due to his personality. On the other hand, his popularity and intense fan base made it a problem for him to be out in public. So these personal photos cast a light on his life that is so fulfilling. In addition to his personal life, the book offers incredible images of his belongings, surroundings and even the people closest to him during his life. You’ll see and read about the closest friends of Elvis, plus fellow musicians during his music career. The legacy of Elvis lives on through these stunning photos. As result, the unique stories and facts from Thom Gilbert are not just informative, but heart felt. Who can forget seeing the image of Elvis in his famous white jumpsuit. Many of his iconic show costumes and clothing are included in this book. Seeing the gold lame jacket will bring back fond memories for many of his fans. In fact, numerous fans have been quoted in the “Blue Suede Shoes: The Culture of Elvis” book. For those who enjoy history, you are in luck. Thom Gilbert includes a timeline of the various parts of Elvis’ life. For example during the early years, he was born in 1935, sign a deal with RCA in 1955 and records the hit song “Heartbreak Hotel” a year later. It became his first of many gold records. Elvis met is future wife, Priscilla Beaulieu in 1959, while stationed in Germany. Many movie fans know of the successful career of Kim Novak. She won a Golden Globe award in 1955. It was for the “most promising newcomer.” In 1958, Kim Novak starred in the amazing Alfred Hitchcock movie – Vertico. entertainment industry stars. His work has been published in leading outlets, such as New York Magazine, LA Confidential, Interview and Gotham. The first book published by Thom Gilbert was “Soul: Memphis’ Original Sound” in 2014. The “Blue Suede Shoes: The Culture of Elvis” book is scheduled to be released in August 2017. Please return again soon to follow this luxury blog. We enjoy sharing unique stories with our readers. 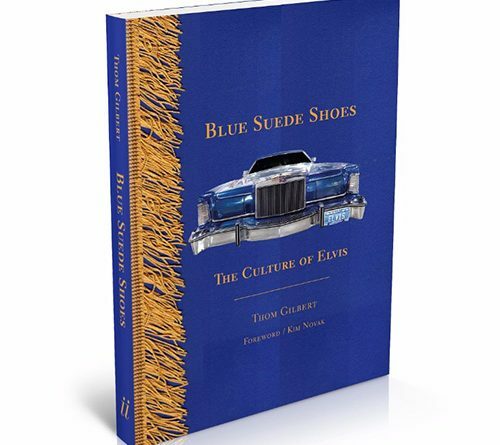 Be sure to purchase a copy of “Blue Suede Shoes: The Culture of Elvis”. Lastly, let us help you plan a trip to Graceland and discover the life of death of Elvis Presley.